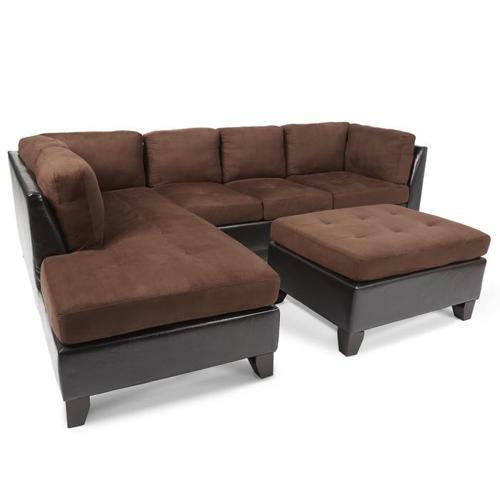 Thank you for visiting my ad for the Abbyson Charlotte Dark Brown Sectional Sofa/Couch and Ottoman. The entire piece is in very good condition, with very light cosmetic wear on the long end of the sofa (last picture), and has been priced accordingly at $900. The sofa was originally purchased in September 2015, and I had paid ~ $2183.18 CAD ($1,633.99 USD). The link to the product page can be found at the end of this description. 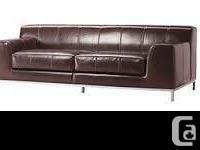 I am selling the sofa since I'll be moving to the west coast, and will not be bringing the couch with me. Please note that this piece is for pick-up only. 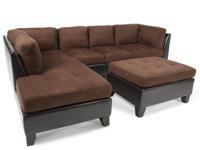 Modernize your home with a minimalist look with this Abbyson Living sectional sofa and ottoman. 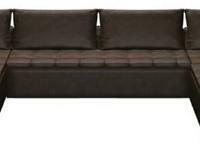 With its hardwood frame construction and its faux-leather and microsuede material, this dark brown sectional sofa offers style and durability, making it an investment-worthy piece perfect for your furniture collection. This sofa's foam-filled cushions make seating extra comfortable.